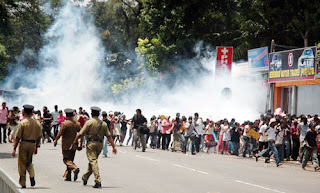 Activists of the Inter University Students Federation (IUSF) who were marching to Temple Trees to hand over a petition to the President, were subjected to a teargas and pressurized water attack this afternoon (August 22nd). The police have done it again, for the third time. 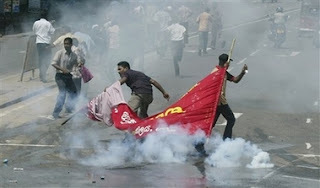 This was the third such attack on protesting undergraduates in Colombo in recent months. Before marching to Temple Trees, the students staged a protest at Lipton Circus, calling upon the government to resolve problems within the university system and not to privatize education or curtail student rights. The marching undergraduates were prevented at the Kollupitiya Junction on Galle Road, from entering the High Security Zone (HSZ). When they pressed on with their advance, the students were attacked by the police. The IUSF is an affiliate of the Janatha Vimukthi Peramuna (JVP), which has been a key partner when the Present government came into power. When contacted, a senior police official told the Media that teargas and pressurized water had to be used on the students to disperse them when they attempted to enter the HSZ. Convener of the IUSF Duminda Nagamuwa alleged that the government was using emergency laws and anti-terrorism legislation meant to be used against LTTE terrorism, to curb student agitations to highlight their reasonable grievances. However, the parent institution of IUSF, the JVP fully supported the implementation of the Prevention of Terrorism Act, and has not been against the extension of the State of Emergency since its reintroduction.